Baked bean manufacturers could end up being the real winners of this lovely economic downturn we’re all enjoying. It seems that so-called ‘recession cuisine’ is booming in the UK and, as soon as former Celtic Tiger cubs get used to the idea of not being able to shell out €10 for a flavourless ‘deli’ sandwich at their local convenience store, Ireland will surely be following suit. I’m surprised some of our take away chains haven’t been a little quicker to capitalise on everyone’s financial misfortune. There could well be major ‘pizza’ wars “out in” Tallaght, where melted plastic cheese and reconstituted pig/cow slices on tomato puree-sodden slabs of thick, spongey toast is the staple diet; but what of the sandwich outlets? Where are their bargains going to come from? 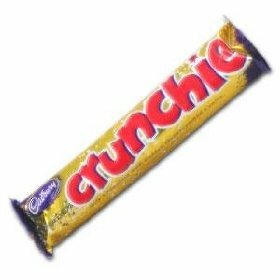 I know – why not sell two slabs of sliced pan stuffed full of crisps and accompany that with a bite-sized Crunchie? Call it the ‘Kredit Kruncher’, and mark it at €2 a pop (with optional student/staff discount) – cheap, cheerful and, most importantly, not even remotely good for you. This entry was posted on October 1, 2008 at 8:30 am and is filed under Food & Drink, Grave News. You can follow any responses to this entry through the RSS 2.0 feed. You can leave a response, or trackback from your own site. I work out in Tallaght and I’ll tell you we have paninis and everything out here. Won’t be able to afford them soon though, so thank Christ we have battered sossies and lots of curry sauce to drink. Incidentally, that crisp sandwich pic you have there is missing a vital factor in making it taste good….handprints. How are the crisps supposed to stay put if they are not squished in with all your strength and sweat?! Good point there, Adam; I was only trying to think how we could encourage former yuppies to slum it by eating this for lunch instead of their customary lobster thermidor paninis from Fallon & Byrne. “Pain Avec des Crips” or some such, especially ‘out in’ cosmo Tallaght. Perhaps if we describe the necessary hand prints as something else too, like “drizzled with ‘palm’ oil”? Or “digitally enhanced”? I can see those €2 coins flooding in. Packaged sandwiches have to have been going at about 800% markup for the past couple of years anyway. There’s one I got one time in college that was literally just two plain, dry slices of bread, toaster-sized slices not even big ones, and then a slice of ham. Nothing special about the bread or the ham. You could buy a sliced pan and packet of ham for that. It’s also far and away the cheapest sandwich they had there. Which is why McDonalds Eurosaver hamburgers got the nod slightly too often. They’ve been using their binoculars to see us coming for such a long time, Karl, and yet we kept rolling up right on cue. No more shall we submit. Shame on you for funding Mc******’s, though – no excuse for that whatever the financial climate! The other point about packaged sammiches, though – they’re ALWAYS awful, regardless of the filling, because they’re refridgerated. Very few things taste delicious directly out of the fridge but especially bread, which just wasn’t designed for it at all. You either eat it freezing cold (and therefore relatively flavourless) or wait until it’s room temperature (and therefore sweaty and soggy). It’s lose lose either way – especially if you’ve just parted with around a fiver for it. By the by – great blog, Karl! Yamamori Sushi have a Credit Crunch Lunch for 18euro!!!!! It includes a glass of “champagne”. ..and irrespective of how bad the economy is there is never an excuse for McDonalds.